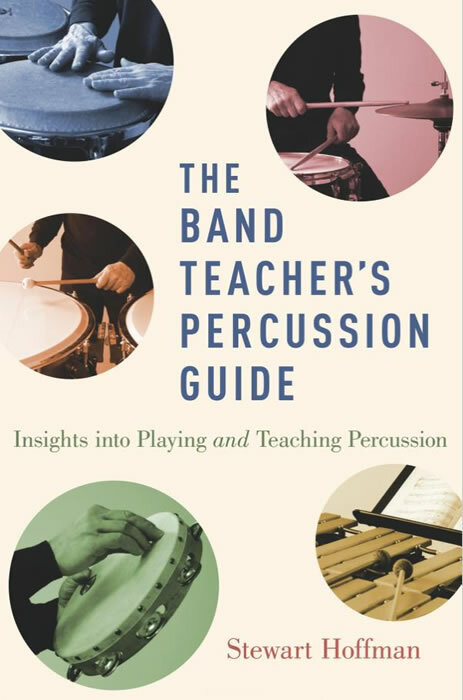 Band Teacher’s Percussion Guide author Stewart Hoffman on playing & teaching percussion, drums and vibes. Packed with info for high school band teachers. Summer is winding down and if you’re a high school band teacher, you’ve likely begun to tidy your band room, organize instruments, search out new music and plan programs. But have you taken the time to focus specifically on your high school percussion program? Have you considered whether all your percussionists will be required to play snare drum, mallet instruments and timpani? 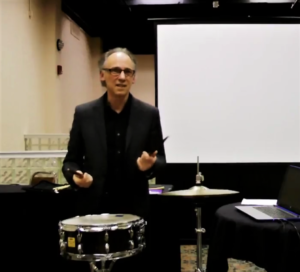 Have you thought about expectations and outcomes, chosen music and considered tests that will develop your percussionists’ musicianship on each of the instruments? Maybe you’re considering having some students play untuned percussion and leaving mallets and/or timpani to someone with piano background? 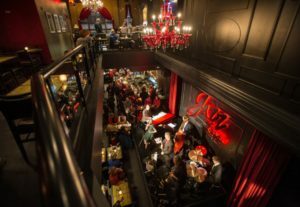 To provide your students with an enjoyable, valuable and rewarding musical experience, preparing a well-considered plan, clearly communicating it to your percussionists, then developing a schedule that best facilitates your plan, is a must. What instruments will the percussionists play? It seems obvious that teachers should decide what instruments percussionists will have to play, but sometimes expectations are not so clear. 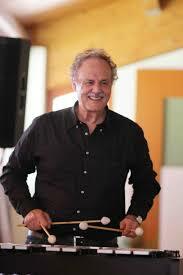 If all high school percussionists play all the instruments – an arrangement that I favour and one that obviously produces a well-rounded percussionist – they should be able to warm up and play at least an exercise or two on snare drum, a mallet instrument and timpani during most classes. 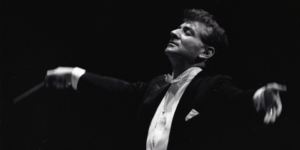 If you decide that pianists will play mallet instruments and/or timpani, I recommend that those playing untuned percussion achieve a working knowledge of mallet instruments in particular. Students who don’t have a relationship with a melodic instrument will have more difficulty relating to and understanding musical theory. 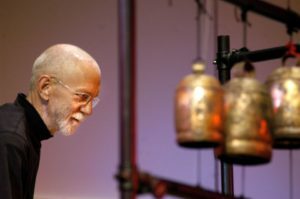 And who knows, students who are eased in to playing mallet instruments or timpani may find that these otherwise foreign instruments are as engaging as the drums that first lured them to the percussion section. What should students practise in a high school percussion program? For percussionists to develop a solid technical foundation, plan to go beyond the requirements of their band method books. 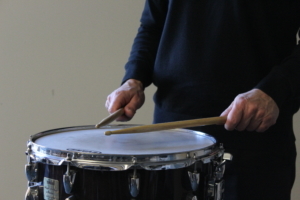 Adding a few basic exercises into the percussion program will guide students to a more controlled technique. When various rudiments and rolls, both buzzed and double stroked, are introduced, augment the material in the method book with specific exercises. When rudiments are introduced, focus on them and have students perform them at appropriate, but challenging, tempi. You’ll find lots of good ideas for additional exercises and tests in books like Ted Reed’s Syncopation, as well as in my Band Teacher’s Percussion Guide, where you’ll also find clear guidelines as to what to watch and listen for when teaching rudiments and other exercises in the high school percussion program. Remember too that by scheduling short playing tests on a regular basis, you will help your students develop a more consistent practise routine and a more fluid and controlled technique. What Should a Good Drum Teacher Teach? When parents invest in their children’s music lessons – on piano, trumpet, violin, oboe or whatever – they expect certain basics to be taught. A functional technique is one of them. They would also expect a teacher to relentlessly steer students away from bad habits that inhibit technical progress or, even worse, lead to injury. The child should be taught to read music, and to understand rhythm and the relationship rhythmic values have with one another – and learn to play with rhythmic precision and at an even tempo. It wouldn’t hurt if the teacher introduced different genres of music – even music from different historical periods – into the mix. And it goes without saying that the teacher will stress musicality throughout every aspect of the learning process. Parents should expect that their children will be taught to play their instrument well, that their musical curiosity will be piqued, that they will discover the rich rewards to be had by dedicating a reasonable amount of time to thoughtful practising, and that a respect and love of music will be instilled. Many instrumental music teachers, to a greater and lesser degree, teach these things. Then why do these expectations so frequently evaporate when it comes to drum lessons? A couple of years ago, a parent came to me with a video of her young son playing drums. He’d been taking lessons and she suspected something might be a bit off. She was right. Clearly, no one had ever told him how to hold the sticks. His arms flailed about. He hammered cymbals and drums with no technique or control. His time was all over the place. He was a thoughtful, conscientious and musical young man (who, I’m delighted to say, is playing very well now) – who had been taught next to nothing through three years of private lessons! Unfortunately, I’ve seen too many students with similar stories to tell. Their lessons, they said, pretty much amounted to hammering out rock beats along with songs. Just think of the reaction if coaches taught sports the same way. You sign up a child to play basketball, only to discover that kids are allowed to just play around on the court at practises. There’s no warm up, no skill development, no shooting drills, and so on. The child has fun, and lets off some steam, but is it a valuable learning experience? Would any parent find that an acceptable way to teach basketball? Of course not. Don’t get me wrong. There are lots of good drum teachers out there, but far too many are content to show students a couple of basic rock beats and a simple fill or two – then let them indulge themselves for weeks on end. They don’t teach a functional grip. They don’t teach rolls or rudiments. Reading is largely ignored. Technique is of little consequence. Solid, even timekeeping is an afterthought. Students learn nothing about the great drummers of the past – or present. In fact, they have no clue as to what good drumming is. Any number of issues related to musicality are totally off the radar. The poor drum student is being done a grave disservice. And parents are being ripped off. The search for a music teacher should not be taken lightly. To increase the chances of finding a good drum teacher, one who will provide a child with a solid technical and musical foundation, consider these 5 points. When it comes to finding a teacher of any instrument, getting a recommendation is a good place to start. And don’t think that, because the student is “just a beginner,” it doesn’t matter how good the teacher is. Finding someone who will set a child off on a solid musical path while instilling joy in learning music is tremendously important. Begin your search by calling a reputable conservatory, school music teacher or neighbour whose child is already taking lessons. And don’t hire the first person you find that will come over to the house for a reasonable price. While you may indeed get lucky and hit upon someone affordable and well qualified, call up a prospective teacher and ask a few questions before taking the next step. Ask the teacher’s background and get a sense of how they teach. Do they place value on developing a solid snare drum technique? Do they balance teaching snare drum technique with drum set technique? Do they teach reading skills? What resources do they use? Do they introduce students to jazz and Latin drumming? After a short interview, you should be left with the impression that they’ve put serious thought into teaching. Once you’ve settled on a teacher, remain involved in the teaching process. Look over entries in notebooks, and what material is assigned. Is the teacher stating clearly what the student should be working on for the week? Have specific exercises and pieces to practise been assigned? Are reminders regarding technique jotted down (“watch that the stick is moving straight up and down” or “remember to drop the stick from a higher level to play accents,” etc.) Along with assigned exercises and pieces, a good drum teacher will provide clear direction as to how to practise them. You can learn a lot by watching and listening to a child’s playing. Do you see and hear progress? Is the child playing with greater control? Does the music and playing appear more complex as time goes on? It may be more difficult for parents with little musical background to get a sense of all this, but there are times when the answers will be painfully obvious to anyone. And don’t neglect to have conversations with children about what they are learning. Let them know that you are genuinely interested. Ask what they did during their lesson, what they like about the lessons, what they are learning and discussing during the lessons. Have them demonstrate what they are learning, and what they’ll be working on when they practise that week. If the child is unable to articulate what he/she is doing, or has little sense of what to work on, it’s time to have a chat with the teacher. Ask the teacher what the expectations should be. Ask about the practice material. In my studio, together with the student, we often write out a practise schedule that he/she can reasonably follow. It might be only 20 minutes long, but the student will know how much time to spend on a warm up exercise, how long to practise the specific snare drum exercises, and how long to practise an assigned drum set exercise. And yes – it’s okay for students to play with recordings during lessons. And they should do so at home too. Drumming with recordings is a great way to develop good timekeeping and listening skills. Working out or approximating the drummer’s fills or timekeeping patterns encourages musical curiosity and creativity. And there’s a lot to be said for just taking time to have some fun playing along with music one likes; playing music is, of course, a joyous experience, and the reason one begins to study an instrument in the first place. But playing along with recordings should amount to more than just blowing off steam and having fun. When done under the guidance of a good drum teacher, and as a component of a well-considered program, students can enjoy the satisfaction of acquiring real skill on the drum set, and gaining a true sense of pride and achievement.